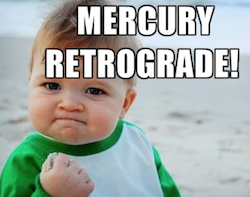 It is Spring is here in the Northern Hemisphere– and this also means we will soon be entering into our second Mercury retrograde of 2015. Although the retrograde this month officially starts on the 19th, prepare for things to start getting a little off balance right now. This is when Mercury enters it’s “shadow period” – so my simplest peice of advice is to be on alert, and do all you can to avoid pitfalls. This can actually be a good thing, since it gets the cobwebs out of our brains and helps make us more aware of what is going on around us. — Do not take what others say to heart. People will often behave in an obtuse manner during these times, because, like everyone else, they are not thinking clearly. If someone around you puts their foot in their mouth, try to let it go. — Check your computer and other electronic devices and back them up! — Don’t make big financial decisions or buy big ticket items if you can possibly avoid it. — Again- don’t take things too personally. All the people around you are going through this period too and many of them will not be thinking clearly about what they are saying or doing. — Read the fine print on any important documents. Sometimes it is necessary to deal with paperwork during a retrograde and if you must handle a transaction, check and double check the details, ask lots of questions and get as much information as you can. — Tie up loose ends and finish old projects. This also applies to people. Do you have a situation with a former friend or lover that is unresolved? Now is a good time to address it, get closure and move on. — Check travel plans and allow for lots of extra time for your travel. Expect delays and go with the flow if they happen. — Laugh. Yes, laugh! The absurdity of these periods can be entertaining sometimes. The craziest things can happen during these phases so it helps to be able to see the humor amongst the chaos. 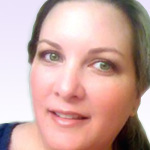 This entry was posted in Astrology and tagged mecury, retrograde on May 13, 2015 by Willow.